Even though all media is social, technology complicates things. Just ask Martin Luther. Few individuals in history have leveraged technology as effectively as he did. His 95 theses, nailed to the church door at Wittenberg in 1517, were amplified by the iPad, or rather the printing press. The printing press had only been around 66 years when he posted his “blog post” about indulgences on the church door, but within seven years, by 1525, 30% all the printed material in Europe had been written by Luther. He used cartoons, bar tunes, pamphlets, all written in the common tongue. And his ideas went viral. Or at least by Medieval standards. I think it’s safe to say Luther would have had a Facebook page. Twitter too. Christians have since adopted radio, TV and film. But now what we call social media is more personal. While technology added speed and scale, now we get all that and one-on-one conversation. Just this last month I messaged an Indian student on Facebook, Skyped with a missionary in Argentina, texted with my son in Chicago. I expect the printing press felt no less amazing to Luther. And while social media can annoy a lot of people, it can also bring about needed change. Luther managed to do both. Christians have no choice about engaging social media for kingdom work, because that’s where most of the conversations are. Consider that since the first web page was published 25 years ago, now there are over 50 billion of them. And consider too that half the population of the world now has a cell phone. There are unprecedented opportunities for evangelism and discipleship as well as saying things that are stupid. At the top of his thesis Luther wrote, “Out of love for the truth, and the desire to bring it to light.” Certainly there is still truth to be proclaimed. And that’s a start. But without love, the Apostle Paul warns us, it is nothing but noise. There is enough of that already. This is the second essay in a series about Christians and social media. It begins here. Check back next Monday for more. 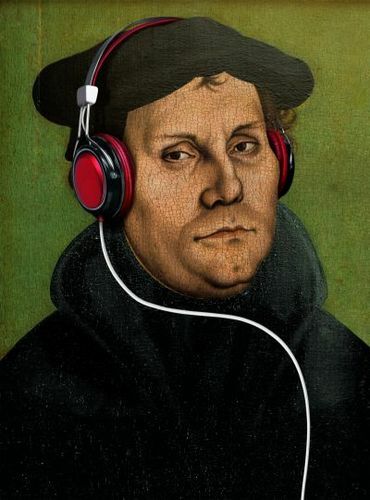 I have an extended essay on Martin Luther and social media here. If you have topics or questions on this topic you want to see addressed, leave comments below. Do you mind if I use the image on your blog post? I want to add this quote and post it on Instagram/FB.